As part of Better, the Copper Box Arena is passionate about improving the health of people in communities and recognise that we are all different in the challenges that we face. The Copper Box Arena provides a full and varied programme of activities for a range of abilities, ages and specialists requirements. As part of its London 2012 legacy commitments, the Copper Box Arena also runs a diverse and plentiful grassroots sports programme for the local community. We have tailored memberships suitable for lots of different people. For those aged 55 and over who are looking to ease themselves into exercise we have our Better Senior Membership for just £22.45 per month. For youngsters aged 11 - 15, we run Junior Gym sessions on Tuesday and Thursday, 4.00pm - 5.30pm, and Saturday, 12.00pm - 2.00pm, which are fully supervised with a dedicated instrutor. Better Junior Membership costs £14.95 per month. Our award-winning Healthwise scheme introduces people to the benefits of exercise as a way to help manage existing medical conditions and help reduce risk factors for chronic disease. Our Healthwise scheme is for local residence and communities surrounding the Queen Elizabeth Olympic Park. Common referrals include people suffering from high blood pressure, diabetes, obesity, asthma, circulatory and respiratory diseases, depression and anxiety and arthritis. GLL’s firm belief that physical activity can have a beneficial effect upon the health of an individual, underpins our commitment to the provision of a Physical Activity referral programme, ‘Healthwise’ on Queen Elizabeth Olympic Park. 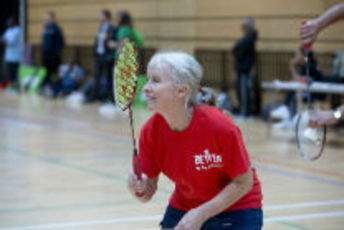 The Better Health Team provide tailored physical activity and exercise programmes for patients with risk factors for medical conditions or for those with existing long term conditions at an affordable rate – it is a programme designed to help people manage and improve their health. Individuals who are not already active and who have a medical condition may be suitable for referral to this programme. Please note that this service is only available to those living within close proximity to Queen Elizabeth Olympic Park. Along with long term partners West Ham United Football Foundation, we've started weekly indoor walking football sessions aimed at people who are retired or semi-retired. Open to members or non-members, the weekly walking football session is held on Thursday mornings 10.00am-11.00am. To book a place contact Darryl Gheerawo on 07803 201299 or email dgheerawo@westhamunited.co.uk. As part of our London 2012 legacy commitments, we support a range of sports clubs and teams. Baku United FC is a futsal club based in London with matches reguarly taking place at the Copper Box Arena. Established in 2008 by the Odlar Yurdu Organisation, today the now professional club is part of England’s National Futsal League. In 2014, the club became first English side to reach UEFA Futsal Cup and has amibitions to reach the Elite Round this prestigious European futsal tournament. Baku United FC’s vision is that futsal in England should not remain only on the amateur level but it has to move a leading position in the European futsal. Given the football and team sports’ traditions in England, the above mentioned vision doomed to success subject to right approach and commitment. Leyton Netball Club is a multicultural and diverse club, which is always pleased to welcome new players. Reguarly training at the Copper Box Arena, the club offers an excellent standard of training and teams participate in a range of leagues ensuring continual development and challenges for players. The club has recently been promoted to the England Netball Premier 2 national league and currently have tw teams in the Essex Met netball league. The club prides itself in having Pat Meadows, current England selector and ex-England player, as its Head Coach who is supported by talented and experienced Assistant Coaches and volunteers. Leyton Netball club is committed to providing a safe supportive environment for you to participate in netball. We work towards the ethos set out by the governing body, England Netball, in becoming an accredited club as part of the Club Action Planning Scheme (CAPS). Established in 1998, London Titans Wheelchair Basketball Club is the leading wheelchair basketball club in London and the South East. The Raiders first team currently compete in the Super League, placing the team amongst the top eight teams in the UK. The Raiders second team competes in the 1st Division South and the Raiders third team competes in the 3rd Division South. The Copper Box Arena supports a range of community programmes. Salaam Peace is a local community organisation which promotes positive reinforcement in young people through sport. Based in East and North London, Salaam Peace haS regular sessions at the Copper Box Arena, using the gym and Arena for sports sessions. The partnership work with Salaam Peace has helped hard to reach communities be inspired by the London 2012 Olympic legacy through allowing regular access to the venues. Fit For Sport have been providing school, family and community programmes for over twenty years; supporting and delivering in school, after-school and holiday camp activities across the UK and training hundreds of children’s activity professionals each year through our training academy. During the school holidays, the Copper Box Arena and GLL partners with Fit For Sport to stage a fun and healthy alternative to traditional holiday camps. Fit For Sport Activity Camps offer an engaging approach to childcare and are suitable for boys and girls aged from four to 12 years-old.